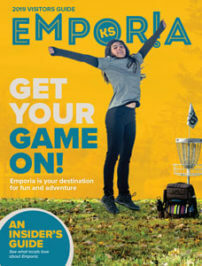 Whether a team building activity, a wedding party, or just a group of friends that get together for the weekend, you’ll find the perfect adventure here in Emporia! Have a bridal shower at Paint Date & Décor or a wine tasting at the new Twin Rivers Winery and Gourmet Shoppe. While taking in the downtown area and Commercial Street, USA Today’s #1 rated Best Main Street in the USA, enjoy several boutiques, antique shops, and indie & specialty stores. Take your office party outside with a round of disc golf! Get inspired by local business making it big with a warehouse tour of Dynamic Discs. While on tour, your group will be able to hot stamp their own commemorative disc. Never played? No problem. The staff at Dynamic Discs will take the time to teach the basics! Meeting here off the interstate with friends from across the country? Stretch your legs on a short stroll through the David Traylor Zoo. This botanical setting is home to the new Mission Madagascar exhibit and is one of the smallest accredited zoos in the country! You’ll be done in time to grab a bite to eat at one of our local favorites! Try a sandwich with homemade bread from Amanda’s Bakery, authentic Mexican, a Laotian noodle house, savory barbeque, flown-in-fresh seafood and so much more! Keep the party rolling seamlessly from dinner to drinks at Radius Brewing Co., known for their brick-oven pizzas and craft beer brewed in the center of the dining room! For more nightlife options, click here.